Last night, Will and I finally made it to the west side for dinner. We’d been meaning to try out Rustic Canyon ever since we found out Jeremy Fox was now cooking there. It seemed like a good idea, since he’s been known to cook creative vegetable-heavy dishes and it wouldn’t be a stretch for Rustic Canyon to do some vegan dishes. We started off with the marinated olives and marcona almonds. The almonds flavored with sugar and lavender are said to be one of Fox’s signature dishes and it’s no wonder why. What at first smelled like a bowl of potpourri turned out to be a bowl of addictive, strangely spiced almonds. The olives marinated with fennel, orange, and garlic were also a nice surprise. Everywhere in LA has a bowl of marinated olives now, so we were expecting more of the same, but something made these olives taste really bright and different. The beets and berries, as suggested by our server, was a slightly different take on the ubiquitous beet salad. The dressing was overly acidic for my taste, and I like pretty sour stuff. It could have been balanced out had there been more avocado in the salad. The addition of mint gave it an unexpected pop which I liked. I also had the squid ceviche: a quirky combination of squid and melon that actually worked. The squid was gently poached in salted water, so not a traditional ceviche. Each piece was perfectly tender, and the entire dish was dressed well with a good balance of acid and richness from the sauce below the squid. I also liked the slightly sweet pickled slices of chili pepper. We also had the focaccia with burrata and eggplant caponata. While good as a plate of bread and cheese, it wasn’t as successful as focaccia. The top of the focaccia didn’t seem done enough and the bread was denser in the middle than I expected. It seemed like the dough wasn’t given enough time to rise, or something. I’m not usually one to complain about a dish to the restaurant, as long as it’s edible, but since the server asked how the bread was, I told him the truth. He assured me that this was a different “style” of focaccia, since focaccia differs from region to region and that it was meant to be rustic. Fine. We’ve had focaccia up and down the west coast of Italy and this was not like any of the different focaccia in any region we visited. Not pictured was a chickpea stew with tomato sauce which was really good, vegan, and tasted amazingly like meatballs with red sauce. We also had a bread stew with tomato sauce, which tasted similar to the chickpea stew. This would have been a safe dish if not for the basil kimchi on top. It was really spicy and unexpected, and gave what would have been a boring dish a little zing. One of the hardest decisions of the night was picking between the Tcho chocolate cake or a scoop of sweet corn ice cream. The sweet corn ice cream won out and it was so good I don’t regret it at all. The slightly salty, creamy, corn taste was exactly what I had pictured when I read it on the menu. It was so good, I didn’t want to waste any time taking a photo of it. My feeling about Rustic Canyon is a little mixed. I over heard the staff say that Fox wasn’t in the kitchen that night, so it might have been attributed to that, but I thought some of the dishes didn’t seem that balanced and leaned toward the too much acid side. And while most of the dishes were good, nothing really blew my socks off. I couldn’t help feeling that this was a case of a good chef and a good restaurant but neither being a good fit with each other. Step 1: Locate the breakfast spot, usually in a residential alley. Telltale signs are giant, bubbling pots, a charcoal oven with a huge bamboo steamer basket of rice over it, a precarious deep fryer with golden sticks of airy you tiao sticking out of the fry basket, and a counter dusted with flour. 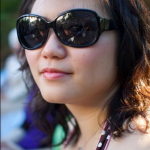 We were lucky that the proprietors of our go-to spot was always shaping fresh dough for deep frying. Step 2: Order a piece of fried dough, most likely a you tiao and a bowl of savory soy milk. I went to one place where the server gave me a bowl with all the savory toppings and some vinegar already in it. Then she fetched a steaming ladle full of fresh soy milk and poured it into the bowl so that the soy milk congealed on the spot. Don’t forget to dip the you tiao into the soy milk. Step 3: Also try out the fresh silken tofu. This is a more congealed form of the soy milk. The savory toppings often contain green onion, pickled vegetables, tiny dried shrimp, and soy sauce. You tiao also goes well in here if you tear it off into bite sized pieces to soak up the salty broth. Step 4: Order a rice hash brown (chi fan gao) for the road. It’s best to order this on your way out, because it is perfect straight out of the fryer. The outer layer of crunch is a perfect envelope to the sticky, dangerously hot rice packed in the middle. Protip: If you’re vegetarian, you can order the savory items without the dried shrimp. Living in the SGV, with its dizzying selection of regional Chinese restaurants, has its benefits, but there are some things I still miss from Shanghai. One of these things is the jian bing, a savory egg crepe that’s best eaten seconds after it comes off a hot plate. I feared that the fast modernization of Shanghai which was quickly replacing the old style tenements with luxury apartments would be the death of street food like this. 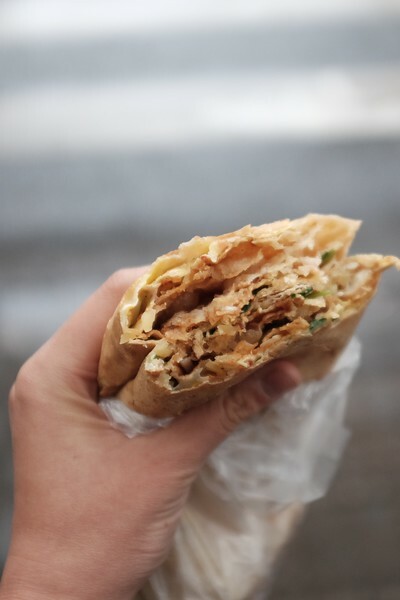 I was grateful that on my last trip to Shanghai, there was not only still jian bing to be had, but that it was only a block away from where I was staying. 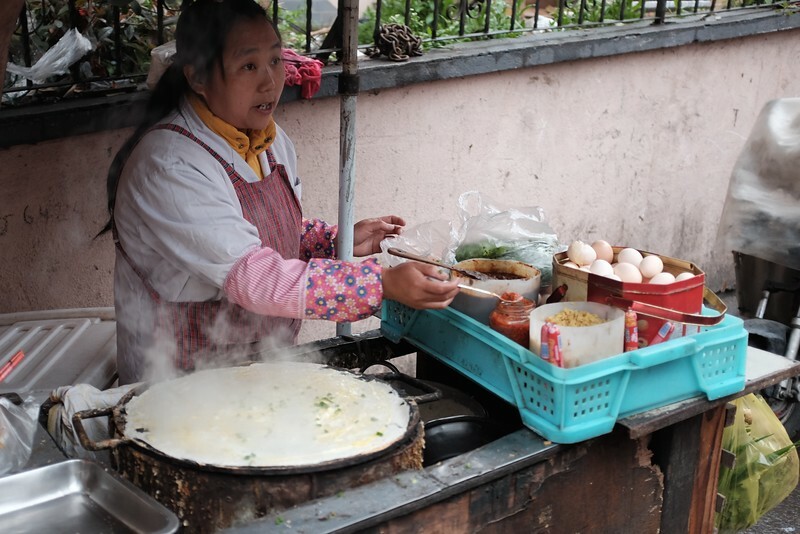 The telltale sign of a jian bing vendor is a large, round hotplate. It’s something that can be spotted from far away. The small crowd of people waiting for their breakfast is also a good sign. For less than one US dollar, I got a crunchy, savory breakfast that I had been looking forward to for years. 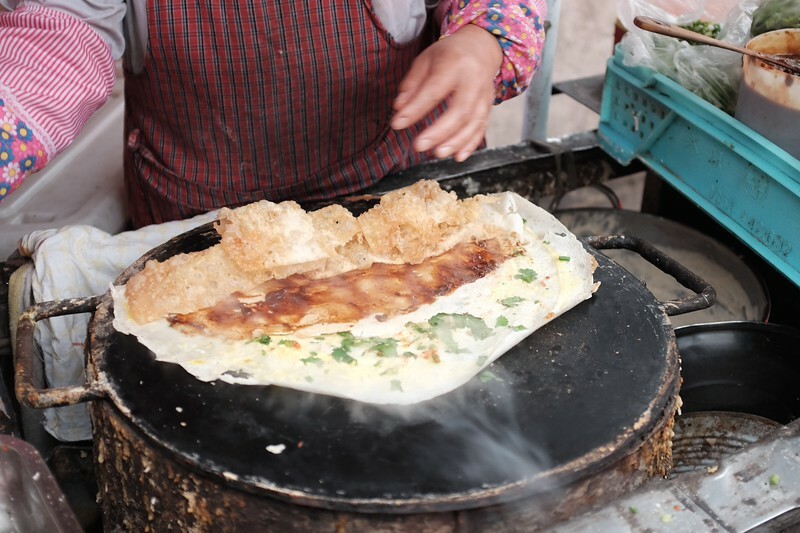 The jian bing vendor, a woman with a friendly but no-nonsense face, was a seasoned pro — quickly manipulating a thin layer of batter onto the hot, coal-heated hotplate. While the wheat batter cooked to a crisp, she broke an egg over the top, quickly spread and scrambled the egg before it set, smeared on a sweet and salty bean paste, some thin, spiced potato strips, a sprinkling of cilantro, and then a deep fried wonton wrapper. With her hands and a spatula, she deftly turned up the edge of the crepe, rolling it over itself into a long tube. Then “crunch!” as she used the edge of the spatula to crease the middle of the crepe, folded it in half, placed it into a thin plastic bag before handing it to me. She told me to eat it on the spot, reminding me to bite through both halves in one go. Still steaming from the heat, and pungent from the spiced potatoes, it was a great start to the morning. On subsequent mornings, it became fascinating to watch the different customizations of jian bing customers were getting. Some prefer the added crunch of adding a you tiao (fried crueller). While she has a handful of you tiao (for 1RMB) for those who prefer it, one can also walk across the alley, buy a freshly fried you tiao from another vendor, and bring it over. One customer who lived nearby brought her own egg, saying she had extra at home, and got a 1RMB discount on her jian bing. Another brought his own sausage to add inside. And another wanted a cucumber inside. The customization options are endless. The jian bing vendor also remembered the preferences of her more frequent customers: less sweet, or no cilantro, or extra egg. When she was done making all the jian bing orders of the morning and the customers were gone, the vendor packed up her stuff to go off to her second job, cleaning the house of a tenant of one of the luxury apartments nearby.